/What is SEM, SEO, PPC (and all that other alphabet soup)? What is SEM, SEO, PPC (and all that other alphabet soup)? So what is SEM exactly, anyway? I have been in the Internet marketing space for roughly 10 years now including my time at CBS Radio (where we sold a lot of digital). And even though Internet marketing has been around for nearly 20 years, I still find that many of the business owners I meet are still confused about important Internet marketing terminology. Just the other day I was asked by a prospective client “So what is SEM exactly, anyway?”. Most clients have some vague idea that it has to do with getting your website to show up on search engines. Surprisingly that is still about the extent of the overall understanding of SEM. So, I’ve created a short glossary of the most common Internet marketing terms that are usually abbreviated. My goal with this short list is to clarify some of these abbreviations in layman’s terms. This will be extremely basic for some readers, a refresher for others, and hopefully educational for many. 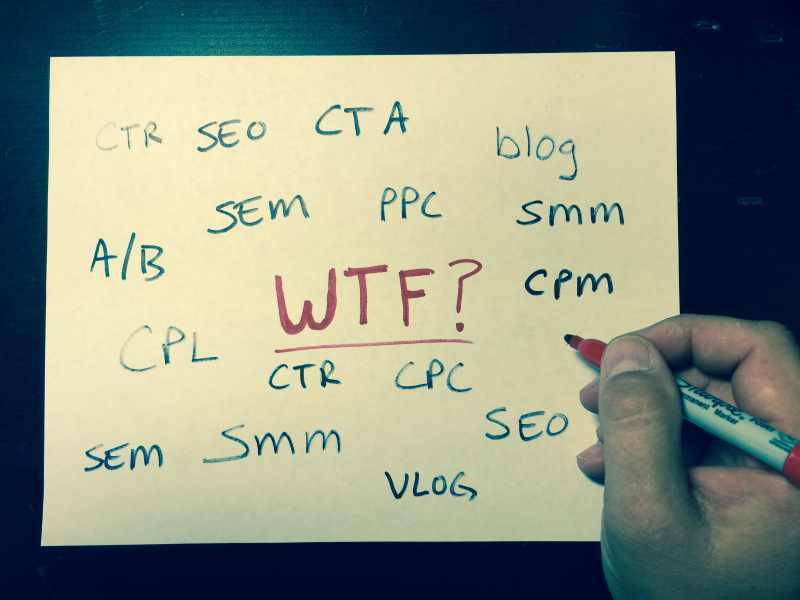 A quick glossary of the more important Internet marketing abbreviations. SEM – Search Engine Marketing: a term encompassing any and all efforts to have a website appear in search engine results, both paid and organic. SEO – Search Engine Optimization: this term refers to the efforts to get a website to appear in the organic or natural search listings. These are the listings that are not sponsored, and you do not have to pay when someone clicks on the link. PPC – Pay Per Click: this is the generic term that refers to paid advertising. Google adwords, Yahoo and Bing paid search, etc. These are the types of links that appear at the very top of search results and along the right side of the search results page on Yahoo and Bing. (Google no longer serves paid results on the right side of the page.) Every time you click on one of these ads, the advertiser pays for that click. SMM – Social Media Marketing: refers to all efforts to market or advertise a business, product, organization, or cause using social media. Both paid advertising and nonpaid techniques are encompassed by this term. CPC – Cost Per Click: refers to how much each click costs the advertiser when someone clicks on their paid ad. This abbreviation also sometimes refers to Cost Per Conversion, depending upon the context. Cost Per Conversion is another way of saying Lead Acquisition Cost. I prefer the latter terminology in order to avoid confusion. CPM – Cost Per Thousand: this is a metric that is often used in digital advertising, or banner ads, to refer to the price of an ad per 1000 impressions (Roman numeral M indicates one thousand, as well as the Latin ‘mille’, hence CPM). This is sort of the original way of selling digital advertising and is slowly moving out of fashion. CTR – Click-Through Ratio or Click-Through Rate: refers to the ratio of clicks over impressions. In other words how many times did people click through to your ad as a ratio compared to the number of times the ad was served up (impression). Generally expressed as a percentage. CTA – Call To Action: refers to something on a website that asks the visitor to take a specific action, such as clicking on a button, entering an email address, etc. When a visitor to a website clicks on a CTA, this is generally considered a conversion. Every website (and I mean EVERY website) should have at least one CTA. CPL – Cost Per Lead: used when the advertiser only pays for the acquisition of a qualified lead. Very clear parameters of what constitutes a “qualified” must be established beforehand, as well as extremely detailed tracking. Generally speaking, the CPL is used as a means to keep an Internet marketing vendor or department accountable for delivering results. Great in theory, but sometimes difficult to properly execute. I realize that these next several are not technically abbreviations, but I’m always asked about them so I’ve decided to define them anyway. Blog: a blog is simply an online article or video (video blog or vlog). A blog for a business should be a means of providing helpful information to prospective and current customers. Digital Advertising: a term often used for multiple things, but generally refers to advertising using banner ads on websites. Impressions: refers to the number of times your ad has been served up as the result of a search query. In other words, a keyword that you have been targeting, whether through SEO or PPC, was used in a search and your website or add was shown in the results. A/B Testing: refers to using two different versions of a webpage, email, ad copy, etc. to see which one works better. I hope that I have addressed the question “what is SEM, SEO, PPC and all that other alphabet soup” sufficiently. Of course this is a very short and limited glossary of terms. I could spend dozens, if not hundreds of pages defining every single term, but most of my clients do not need this. If you are looking for a more extensive list of terms, the glossary at marketingterms.com/dictionary is probably my favorite. You can browse by letter of the alphabet OR category. It tops the search results for “glossary of internet marketing terms” because it’s comprehensive and fairly easy to understand. The Internet Has Made Traditional Advertising Obsolete, Right? →← How Do You Choose Between Ad Agencies? You Wrote an Online Article…Now What? Brian "Buzz" Park is a Marketing Strategist and has worked in the Los Angeles area for the last 13 years in technology sales, radio advertising and Internet marketing. Buzz's burning desire is to help local business owners find, get and keep customers. Who Really Controls Your Company Domain Name? The Internet Has Made Traditional Advertising Obsolete, Right? How Do You Choose Between Ad Agencies? How Do Marketing Agencies Get Paid?